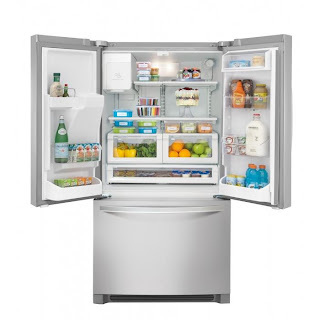 I WON A BRAND SPANKIN' NEW KENMORE FRENCH DOOR REFRIGERATOR!!!!! AHHHHH!! Can you tell I'm excited?! I'll get to the part about HOW this came to be, but first let me show you what it looks like!!! Let me tell you a little bit about her! She has 26.7 Cu. Ft. of capacity. "What do you like best and why do you need it?" "Where do I begin?! First, let me tell you how many times I get up during dinner...let's see....someone needs ketchup, another needs ranch, but only wants it for dipping, so I get up again for a different kind of salad dressing. Oh wait! Forgot the mustard, or someone needs a piece of cheese, or an extra yogurt, a refill on milk.....and on, and on and on the list goes. I just said to my husband the other day, how amazing the day will be when I don't have to get up 20 times during dinner and can actually enjoy my dinner. Having the french doors would be amazing so I can access all of the above mentioned things EASILY! Having the french doors up higher keeps my one-year-old from getting into the part of the refrigerator with breakable items. Yup, he knows how to get into our traditional fridge. And he knows how to find the breakable items and drop them on the floor. The 26.7 cu foot capacity means I can make less trips to the grocery store! I drink Almond Milk, my husband and daughter drink skim milk and my son drinks Organic Vitamin D Milk. I also like to keep orange juice around for recipes and for my morning smoothies. We're CONSTANTLY going to the store for milk because we currently only have room for half gallons of all our beverages. The filtered ice and water dispenser means I no longer have to keep my nasty old brita in the refrigerator! YAY!!! It just takes up much needed space! Having spill-proof glass shelves means that when my daughter puts her cups into the refrigerator without telling us, and then they get knocked over when she reaches for something else, it won't trickle through my ENTIRE refrigerator! When you're a busy mom like me, this would be a life-saver! Having a full-width pantry door would be amazing! We go through a lot of yogurt here, and we kind of play the stacking game with them. You pray when you open the refrigerator that one, or the whole stack doesn't fall on you when you grab one! I take apples to work with me EVERY day, but they take up a lot of space! This means less room for other fruit, which ends up getting pushed onto the shelves....which don't have any room either! It's really a daily struggle. You see, my refrigerator is currently kind of like a tetris game. You have to envision what you're buying at the grocery store and "See" if it's going to fit in your already crowded puzzle. Lots of fun I tell ya! The smooth gliding crisper drawers would be wonderful to have. Every time I open my current drawers, they fall out, then I have to put them back on the track. When my daughter goes to grab fruit or veggies and then doesn't shut the drawer all the way, then closes the refrigerator door, it then gets stuck open. This lets precious cold air out.....and isn't always discovered right away, sigh. Did I mention yet this refrigerator would be amazing to have?! With the refrigerator being stainless steel with a protective coating, I won't have the "black" fingerprints all over my refrigerator like I currently do with my white one. The Mr. Clean Magic eraser has become my refrigerator door's best cleaning friend. I would like to retire those in my house! The smooth touch electronic controls would honestly just be a major bonus. 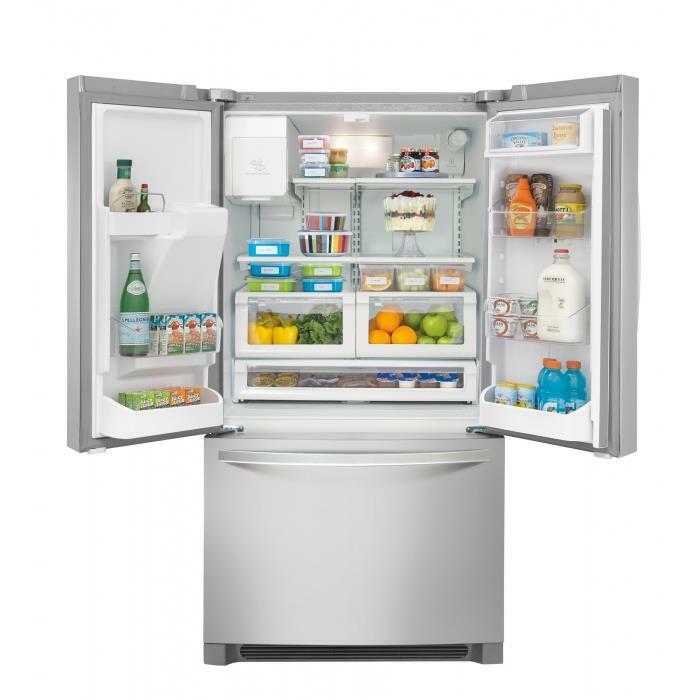 So you see, everything this Kenmore French Door Fridge has to offer makes it best suited for our household! This busy mom could really use a break, and this may just be it! One more thing......did I mention I'm the slow cooker queen? Part of my gig as the author of A Busy Mom's Slow Cooker Adventures is preparing slow cooker meals. MOST of the time, I prep everything the night before and put the crock into my refrigerator. Each and every time I do this, it's like piecing a jigsaw puzzle together. The large capacity of this fridge would significantly take time away from this little "dance" I have to play several times a week! It would be a VERY welcomed change!" And that was it, ladies and gentlemen! As soon as I realized I won the Refrigerator, I began to cry. I am so incredibly humbled and grateful to Kenmore for this entire experience! Again, I still can't believe this is real! WOOHOO!! I would have been crying too!! It was so neat to see you win this in person! Congratulations again, Hope!